A number of McGill buildings suffered water infiltration after a pair of heavy rainstorms brought an estimated 70 millimetres of rain to the Montreal area Tuesday evening. Service Point, the basement of the McLennan Library, the basement of Wilson Hall, and Burnside Hall all experienced some flooding. An emergency generator provided power to the Lyman Duff Building for two hours last evening, but the main power service was restored last night. Classes and services are not affected, with the exception of the McGill University Bookstore on McTavish St., which will remain closed today (Wednesday, May 30). Clean-up at Wilson Hall will continue until at least this evening, but classes will not be affected. A river runs down it: Parts of downtown Montreal were flooded in the wake of two powerful rainstorms Tuesday evening. A number of McGill buildings suffered water infiltration after a pair of heavy rainstorms brought an estimated 70 millimetres of rain to the Montreal area Tuesday evening. Service Point, the basement of the McLennan Library, the basement of Wilson Hall, Burnside Hall and a number of other buildings all experienced some flooding. An emergency generator provided power to the Lyman Duff Building for two hours last evening, but the main power service was restored last night. Classes and services are not affected, with the exception of the McGill University Bookstore on McTavish St., which will remain closed today (Wednesday, May 30). It is expected to open as usual tomorrow morning. Clean-up at Wilson Hall will continue until at least this evening, but classes will not be affected. 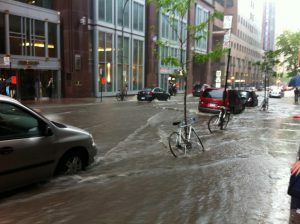 Workers leaving the downtown core last evening were greeted by flooded streets and overflowing sewers. Many removed their shoes to cross at flooded intersections while others simply splashed through several inches of water, some of it fast moving. The Metro’s Orange Line was shut down for several hours after flooding in a tunnel and parts of the Underground City and business and shopping centres like Place Ville Marie also suffered water infiltration. Place Montreal Trust suffered extensive water damage. Dawson College, where about 1,000 students were writings exams, had to be evacuated, and its Tony Proudfoot gymnasium reportedly suffered damage to its hardwood floors. At Concordia University, the Webster Library remains closed due to flooding.